Here is my creation for the Diva Challenge #188. The challenge is to use some LGBT aspect in your tile - as to support the National Coming Out Day on October 11th. So.... I looked up what LGBT means, and I learned a lot ! Thank you Laura for this challenge. It was a nice thing to learn all about LGBT movement, diversity, rainbow, the colours used, the number of stripes etc. 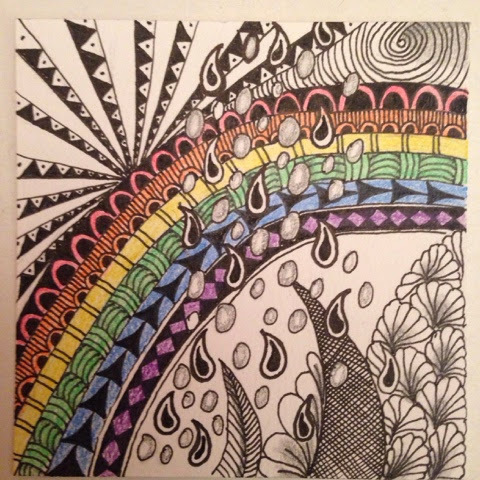 I hope you also can appreciate my zentangle and the diversity of patterns I used in and around the rainbow. This is so nice. Yes, the diversity of patterns is great, but I love the feel of a warm rainy sunshiney afternoon here. The rainbow, with the droplets and the spiral in the corner, like the sun....it's serene and pleasant. Well done! This is a lovely tile. I like the way you used your tangles. Very lovely! I like your rainbow tile! This rainbow tile is so very well drawn.